Edwin H. Colbert, known to his family and friends as Ned, was born, the baby of three boys, in Iowa in 1905. While he was still an infant, his family moved to northern Missouri, and Colbert grew up in the town of Maryville. The Wild West was a fading memory as Colbert grew up, and his grandfather occasionally thrilled the little boy with a first-hand account of an encounter with American Indians, but Colbert remembered a more placid environment in his own youth. He also remembered his own "museum": a glass case holding fossils, arrowheads, even birds' nests. Colbert collected only the nests that had already fallen to the ground; he liked birds too much to raid an intact nest. Despite his own small museum, Colbert didn't decide early on to be a curator. His initial career choice was with the Forest Service, and he spent multiple summers with the service in the Colorado Mountains. On one occasion, Colbert's only coworker commandeered both horses and set off with a 1920s-era psychic from Granby in search of a lost gold mine. Colbert was invited to come along but graciously refused. He found himself with plenty of food, but no way out of the wilderness, and no company. After the hallucinations started, he realized the danger of a completely solitary existence. His boss soon came along, and assigned him elsewhere. He enjoyed the Forest Service, but his original love of fossils defeated his desire to live in the wilderness. It was probably just as well; in the years to come, Colbert would spend plenty of time in the wilderness hunting old bones. Having studied for three years at the university in Maryville, Colbert moved on to Lincoln, Nebraska. The move was difficult as the relatively modest city felt like a metropolis to the young man accustomed to a small town and pristine woods. But Lincoln offered training in paleontology. Besides occasional fossil-collecting expeditions, he tackled the often maddening task of mounting fossil skeletons, getting all the heavy, brittle bones to stay in place. Colbert must have gotten accustomed to life in a big city, because his next move was to Columbia University in New York. Columbia had an arrangement with the American Museum of Natural History. Consequently, Colbert found himself working at one of the world's foremost museums. He steadily worked his way up to greater responsibility and in 1930, he became the scientific assistant to Henry Fairfield Osborn. Five decades later, in his autobiography, Colbert tactfully described his five-year association with Osborn as "a time filled with experiences and incidents." At AMNH, Colbert also met his future wife, Margaret Matthew, scientific illustrator and daughter of the eminent paleontologist William Diller Matthew. The couple married in 1933, and the imperious Osborn doted on the young couple enough to buy them a fancy tea set. Although the early years of his marriage may have been rewarding on a personal level, career fulfillment was slow. The couple struggled to get by on his modest salary, and he supplemented it by working part time for the Academy of Natural Sciences in Philadelphia. When World War II broke out, the military sought officers with scientific expertise, but he was passed over, and as his colleagues one by one joined the war effort, he felt left behind. But changes at the museum pointed Colbert, who had been studying fossil mammals, toward fossil reptiles. And in 1947, he and some colleagues made an astonishing discovery. The men were on their way to the Petrified Forest National Park in Arizona, and only intended to stop at Ghost Ranch, New Mexico, for a few days. Then one of the men, George Whitaker, found a few bone fragments. To an untrained eye, they must have looked uninteresting, even like pebbles. But Colbert's eyes were well trained, and he instantly recognized the base of a claw of a small, dainty, Triassic dinosaur: Coelophysis, illustrated above. Prospecting nearby not only turned up more bones, but entire skeletons, in a dense assortment of carnivorous therapods. The team canceled its plans for Petrified Forest and settled for the summer in Ghost Ranch, treated to the use of a luxurious summer home by a local landowner. Colbert and his colleagues extracted literal tons of rock from Ghost Ranch, holding hundreds if not thousands of Coelophysis skeletons. Such a dense concentration of carnivores has no modern-day equivalent. Although wildebeest and other herbivores may travel in massive herds, carnivores seldom hang out in groups larger than packs, limited by the available supply of prey. The number of Coelophysis at Ghost Ranch remains a mystery. While examining a couple skeletons of the dainty dinosaurs, the AMNH team seemed to find evidence of particularly un-dainty behavior: cannibalism. The ribcage of one adult appeared to hold the skeleton of a juvenile of the same species. On this point, Colbert was posthumously corrected. Some 50 years after the cannibalistic conclusion, graduate students at Columbia University determined that the bones were saurian but not coelophysian. While at Ghost Ranch, Colbert got to make the acquaintance of the artist Georgia O'Keefe, who had fallen in love with the rainbow of colors of the Chinle Formation, in which Coelophysis fossils occurred. O'Keefe was hardly the last VIP Colbert would meet. Decades later, while on a fossil-hunting expedition to India, he and his wife had tea with Prime Minister Jawaharlal Nehru and his daughter, Indira Gandhi. Other fossil-collecting trips abroad were a little more awkward. While digging for fossils in the Karroo Basin in South Africa, well before the end of apartheid, Colbert endured in silence a rant from a local about international persecution of Afrikaners. In addition to work at the AMNH, Colbert authored multiple public-interest books, including The Age of Reptiles . That book included what might be called the first "modern" depiction of a theropod, with a back parallel to the ground instead of the kangaroo-style tripod pose. Alas, the improved reconstruction still included froglike eyes and a lizard-style snout. Colbert witnessed the long-time rejection and gradual acceptance of Alfred Wegener's theory of continental drift. Initially a skeptic himself, Colbert was finally convinced by Lystrosaurus, a bulky, boxy, herbivorous reptile from the early Triassic. A vast ocean today separates Africa and India, but Colbert found Lystrosaurus in both places. And about the time he retired from AMNH and moved with his wife to the warmer climate of Arizona, he found the squat reptile in what might seem like the least likely locality. 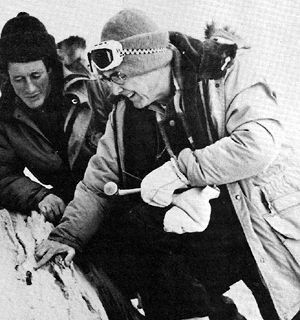 In the late 1960s, no longer considering himself a young man, Colbert ventured to Antarctica to hunt fossils. The trip was complicated. Stormy weather thwarted repeated attempts to fly to the icy continent from New Zealand, and once he arrived, Colbert found himself so intimidated by relentless, screaming winds and lectures on frostbite accentuated by grisly slideshows that he considered turning around and heading home. Even worse, while he was at McMurdo Base, news of a helicopter crash claiming two lives shocked the research community. (Colbert witnessed another helicopter crash first-hand, although everyone escaped unharmed.) Once in the field, he had to navigate icy slopes, wield rock hammers while wearing mittens (which he managed, as shown in this photo), and figure out how to secure fossils without plaster (water would freeze instantly). But the efforts paid off. Lystrosaurus, Colbert confirmed, lived in Antarctica too. To his mind, the boxy reptile on three remote continents was all the proof anybody could need that continents do indeed travel over time. Colbert returned to his new home in Arizona, where he worked as a curator at the Museum of Northern Arizona. He lived to be 96 years old, passing away in 2001. His wife Margaret, who illustrated many of his books and articles, including the fleet-footed Coelophysis shown above, died in 2006 at the age of 95.